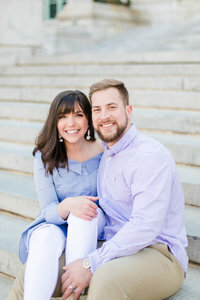 After our engagement session with Katie & Brett, we headed back home to Southern Maryland for Amber & Michael’s Southern Maryland vineyard first look and Bride & Groom Portraits! Amber & Michael have an amazing family member who was photographing their wedding day, so they only asked us to do their wedding portraits and of course we said yes! You see – it’s always a HUGE compliment when another photographer asks you to photograph them on their wedding day! Especially one that is as talented as Amber. Check out her amazing work on her new website! Click below to see some more of our recent Southern Maryland weddings!